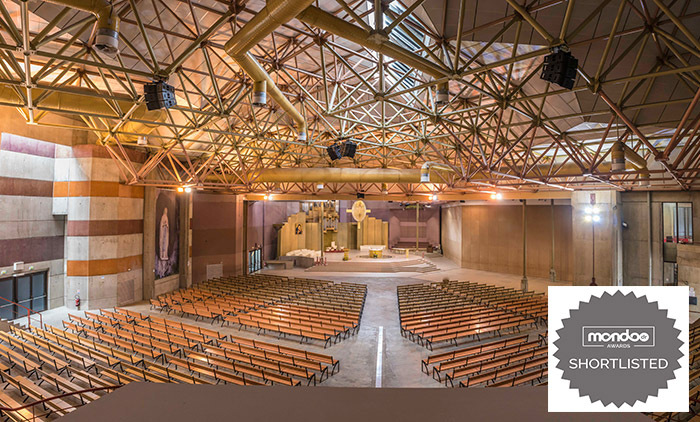 APG has recently completed a milestone installation in an iconic church situated in what is arguably the most important place for Christians worldwide: The Sanctuary of Our Lady of Lourdes. 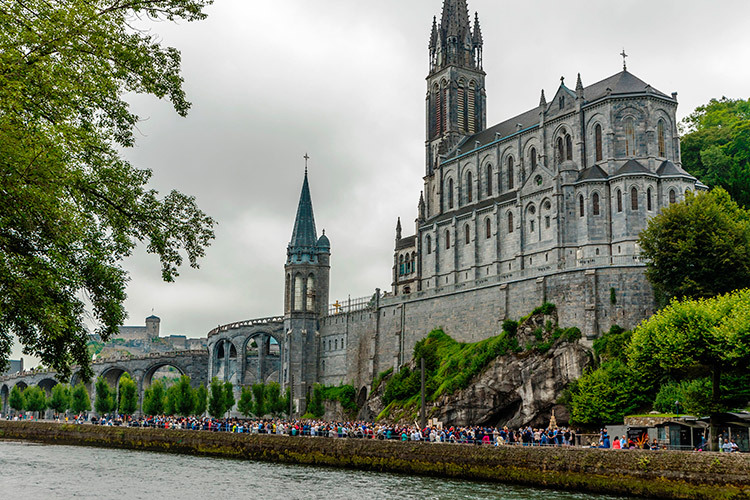 With over 6 million visitors each year – Lourdes has the second biggest hotel capacity in France after Paris – the 15,000 population French city sees dozens of services taking place every day across 22 separate worship buildings, most of which are recorded and broadcast live on the dedicated website. APG has been providing the outdoor sound reinforcement right across the sacred site for as much as 25 years. “We get extreme temperature variations in this region, from scorching summer days to freezing winter nights. It’s quite amazing to think that we only ever had to replace a handful of diaphragms from the 80+ APG speakers over the years,” comments Lourdes AV technician Daniel Pinout. The robustness and audio quality of APG’s old speakers left such a great impression that, according to M. Pinout, a competitor who visited the site confided in him with humour that it was “very urgent to do nothing” with the outdoor sound. 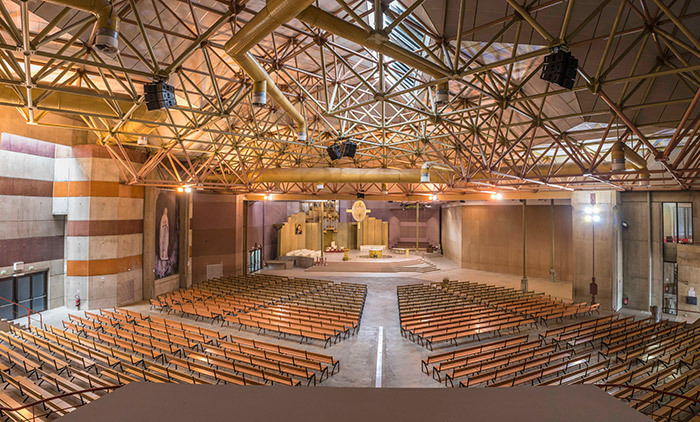 This reliability probably also helped to tip the scales in favour of the French manufacturer when the Lourdes AV team received the green light to upgrade the Church of St Bernadette. 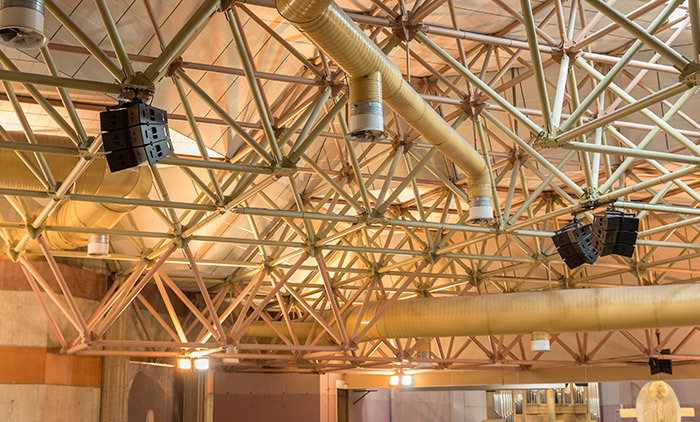 The AV team enrolled consulting firm Gamba Acoustique who applied a series of acoustical measurements in order to describe the different principles and sonic solutions for this complex venue. Many proposals were received, and only two were shortlisted. It was Biarritz based ACE Event who won the contract by going the extra mile. Enter BLEV Organisation‘s founder and director, Bruno Le Vacon. 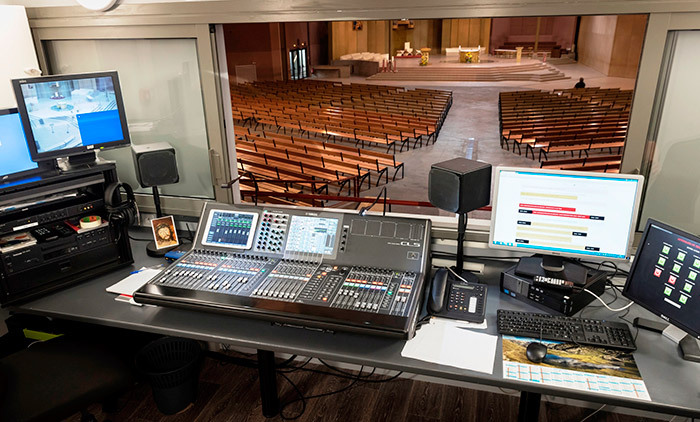 An eminent figure in the pro-AV industry in France, M. Le Vacon was hired as project manager to ensure the successful audio deployment of the Church of St Bernadette. Indeed, the church has many configurations depending on usage: It can be used in its entirety or divided into two to make use of two areas simultaneously. Both parts can then also be reduced thanks to heavy curtains situated at the back of the church. The consultants advocated a system that would not only be flexible but also evolve to host more front fills or bass cabinets depending on the requirements. Finally, because it runs from 7am to 11pm every day, the speakers had to be extremely reliable. Inevitably, the success of a project is evaluated on the end result, and everyone is enthusiastic. M. Pinout commented: “We now have great intelligibility and the coverage is very wide and even throughout. There were other proposals with a much larger number of clusters but seeing that ACE Event achieved what they have with such a small quantity of speakers, the APG system has definitely exceeded expectations.